We welcomed elder Pichekiix (Mariano Xitumil) who was gracious enough to spend several days with us, sharing knowledge and wisdom. We added to our video library with several additional hours of footage, delving deeper into various topics including understanding more about some of the other calendars our there, including a calendar of music (with 20 tones), seeds and more on the calendar of death. He also spoke about diet, seeds more generally, and of the men of light and darkness. Denise and I met with Rafael of Groupo Sotz’il, a local art and dance company that uses modern interpretations of these forms as a way to maintain the Maya tradition and engage Maya youth (Kaqchikel) in a deeper connection and experience with the tradition. Rafael shared a book the group produced, entitled Ati’t Xajoj that does a fantastic job explaining the Nawales (animals) for each Ch’umil, including identifying the reason and source of information. They even have a guide for animal dance movements to go with each Nawal. This is an area we came into this trip interested in exploring, as there isn’t always consensus on the topic, yet we hope to incorporate information on the Nawales into some of the materials we offer. We discussed exploring ways that Saq’ Be’ and Grupo Sotz’il may partner and support each other’s work in the future. 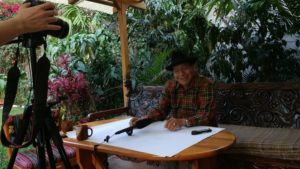 We had the good fortune to spend time with Don Pedro Ixchop, whom you may recall, has contributed the prayers that are published in the Daily Ch’umil for each Trecena. Don Pedro is the head of the Association of Maya Ajq’ij. We were able to film a fascinating presentation of the initiation process for Maya Ajq’ij that was used before the current process of “walking 20 altars”. Don Pedro also discussed how the Maya tradition is founded on a mathematical understanding of the world, and without that mathematical basis, much of the tradition can not be deeply understood. We discussed his hopes for the Maya lineage moving into the world and ways for Saq’ Be’ to support its continued vitality here in the homeland. 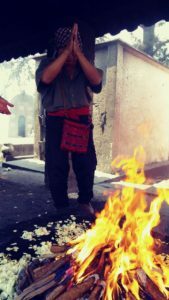 He also spoke about each of the Ch’umil’al, the associated numbers, and offered a prayer in Kich’e. In case you missed it, you can still check out the Facebook Live we did with Carlos Barrios. In it, Carlos delivers a message for these times, discussing the energies that follow 2012, why we are in the time of “ego” and how precarious these years can be if we don’t pay attention. He shared thoughts on the importance of connecting with water, and the intersection of understanding personal purpose and creating societal transformation. Be on the lookout, we may have an opportunity to get in another livestream video or two while we’re down here! By the way, check out this article from the archives where Carlos gave an interview discussing his path to becoming an Ajq’ij. Let us know what seems interesting, exciting, relevant or what you’d like to learn more about in the comments below. Until the next dispatch… Maltiox! Adam is a founder of Saq' Be'. Having first met some of the Maya elders in 1998, he has been blessed with the opportunity to spend time with communities and bearers of living lineages in Guatemala as well as other regions of the Americas.Adam is fortunate to be able to commit his life's work to opening opportunities for greater eco-social-spiritual benefit, integration and realization.